As soil health improves, so too does its hydrologic function. This graphic illustrates how much additional water could be stored in the soil of all U.S. cropland with the addition of 1 percent of organic matter. While most look to the sky for drought relief, an increasing number of farmers are looking to the soil. And for good reason: Healthy soils capture and store much more water – which can come in handy during dry spells. Through its “Unlock the Secrets in the Soil” campaign, USDA’s Natural Resources Conservation Service is leading the effort to get more farmers and ranchers to adopt soil health management systems for a wide range of on- and off-farm benefits – including drought resiliency. So what’s the water-banking secret in healthy soil? 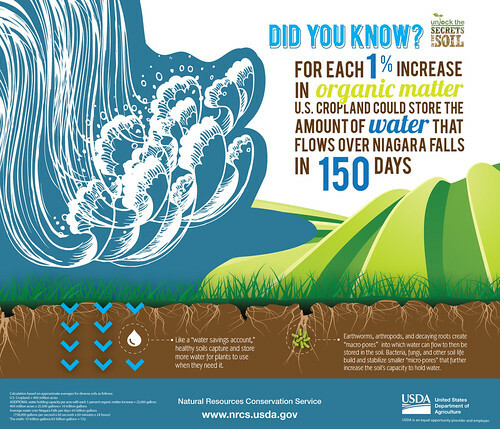 “Organic matter and living organisms provide the foundation for soil to function properly, allowing it to take in, store and deliver water to plants, among many other benefits,” said NRCS’ Soil Health Division Director, Dr. Bianca Moebius-Clune. “Organic matter causes soil to form stable soil aggregates, or crumbs,” she said. “With better soil structure, infiltration of water into the soil improves, which allows the entire soil profile to take in and hold more water when it rains.” Healthy soil acts much like a sponge, with its ability to absorb and hold much of its volume in water. The difference between healthy, stable soil and degraded, unstable soil can be seen dramatically in NRCS’ soil stability test video demonstration. In healthy soil, earthworms, arthropods and decaying roots create “macro-pores” into which water can flow to then be stored in the soil. “Bacteria, fungi and other soil life build and stabilize smaller ‘micro-pores’ that further increase the soil’s capacity to hold water,” Moebius-Clune said. All of us can take those soil health benefits to the bank. 150 FFA Nebraska chapters and 6,000 FFAers are learning more about soil health. With a Nebraska Environmental Trust $200,000 grant, students are doing soil research projects on diverse studies. Five FFA chapters have qualified for National soil judging contests the last two years. Soils and water are important resources for all aspects of life on earth.